I love Christmas and one of my favorite parts of this season are the traditions. Now that I have my own kids it is even more fun to create new traditions with them. A new tradition that I am going to be starting this year with my daughter is to paint nails on Christmas Eve. To do this we will need nail polish so of course we will use my favorite nail polish for my daughter, Piggy Paint, and my favorite nail polish, Sophi nail polish. Piggy Paint is my favorite nail polish for little girls. I have done reviews with Piggy Paint a couple times before and I am always impressed. This time I got to try out a few new colors with my daughter as well as their nail polish remover and some nail art. A couple of the colors we got were ones we already had but that just meant that my sister’s nail polish collection grew. I really like their light purple color, it is a color I would put on my daughter’s nails and my own. I didn’t have too high of expectations for the nail polish remover but it ended up working really well. The great thing about their nail polish remover is that it is biodegradable, does not contain acetone but does contain aloe vera and vitamin E. So it may not work as well as other nail polish removers but it is a lot better for your skin and health. My daughter loves the Piggy Paint nail art. As soon as she saw that we got some more Piggy Paint in the mail she was very excited. We opened the package together and she waited as I unwrapped every one so she could see what new colors we got. Then when we got to the nail art she freaked out and asked right away if we could paint our nails. We got all of our polish out and she chose one color for each nail, as always, and then she had fun picking which crowns she wanted on top. These stickers are sure to make any girl feel like a princess. I was very impressed with how well they stuck to her nails and how long they ended up staying on. Sophi nail polish is my favorite nail polish made for women. 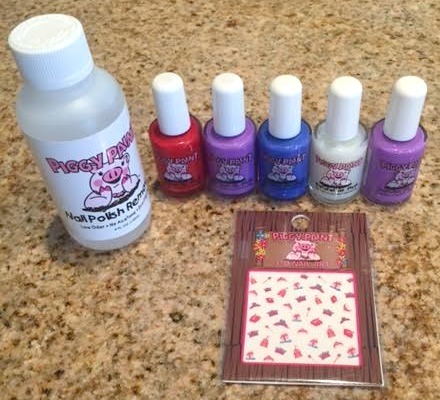 When I found out that Piggy Paint came out with a brand of nail polish for women I was very happy. 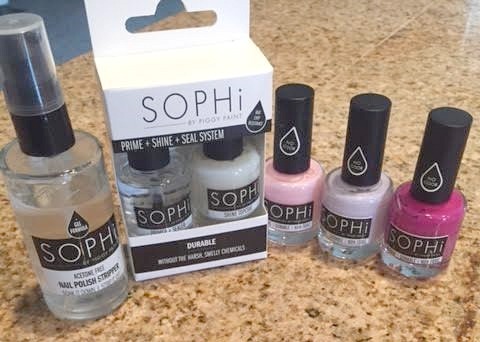 All of the great benefits that Piggy Paint has is also in Sophi nail polish which means Sophi is better for your nails and skin than other nail polishes. I loved getting my new Sophi colors, especially the pail colors. I also do not do my nails without the Prime + Sine + Seal System because it gives my nails a beautiful shine while also helping my color stay on longer. I always love how my nails turn out after putting on some Sophi nail polish. 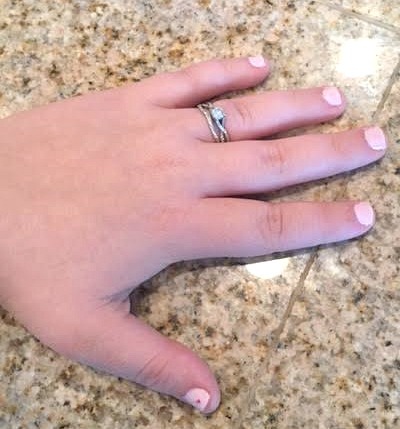 I even tried out a Piggy Paint nail art on my thumb to match with my daughter. This will be such a fun tradition to start with my daughter so we have beautiful nails every Christmas morning. It will be especially fun to have that bonding time just her and me. What kind of traditions could you start with Piggy Paint in your family?